I got into the taxi when it came, and the cab driver made a few tries at conversation, and I tried but couldn’t summon up much. I was polite, but couldn’t quite get the groove of it, and after a few minutes he said “Ah, it’s still nighttime. 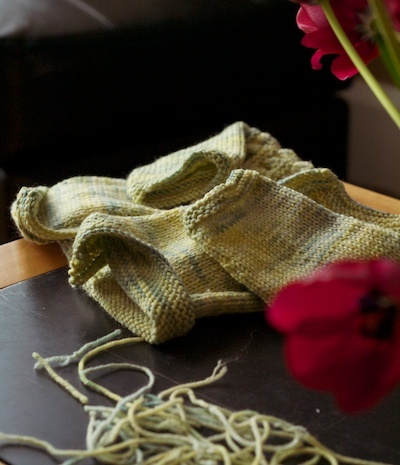 Let’s go quietly.” I sat in the back and knit on my sock, staring out at frozen Toronto, and thought about the cat, who was looking at me with a curious rage when I left. I think she noticed that Joe and I both had suitcases out. He’s leaving for the Junos and I’m for the DFW Fiber Fest (which is sort of like the Junos, if you approach it the right way, which I do, although travelling together would be cool if it happened) and when I left I am pretty sure the cat was trying to figure out who’s side of the bed to pee on as revenge. 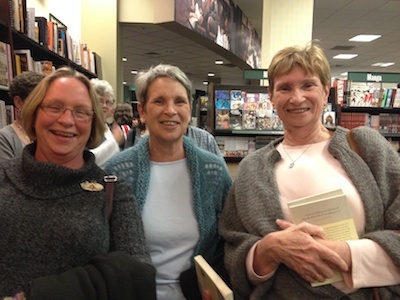 As much as leaving again unsettles me, so soon after the book tour, I’m really looking forward to this weekend. I love teaching and speaking, but really, I’m serious about the marketplace this time. I was going through my stash the other day and realized that a lot of my yarn is wrong. How you can have that much and have pretty much all of it be breathtakingly, spectacularly wrong is beyond me, but I’d noticed over the last year or so that a theme was developing, one where I think about knitting something, go to the stash and then mysteriously find myself in a yarn shop with a big bag and a vaguely dirty feeling. I think I’ve regressed, fallen back into a nasty little single skein habit, thinking that it saves me money to buy a little of what I like, when in reality it doesn’t save me a dime. 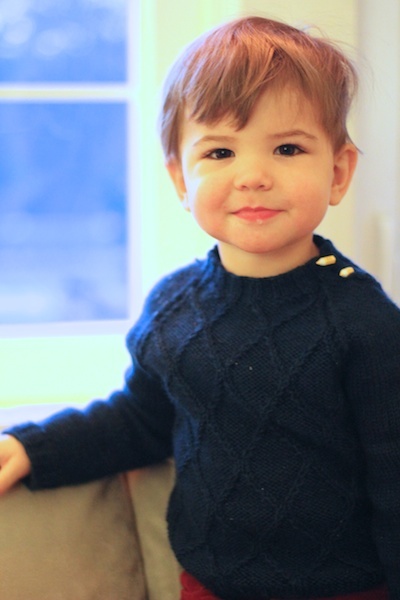 There’s no savings if you buy the single skein one day, then the sweater’s worth another day. I see that now. I’m going to fix some of that this weekend. They’re calling my flight. See some of you in Dallas. 1. Blocking and stretching are not synonyms. They do not mean the same thing. 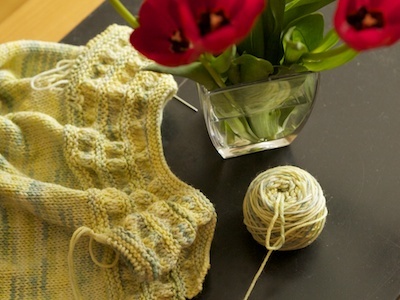 Blocking can sometimes involve stretching, like with lace, but most of the time it’s important to remember that blocking in knitting is like blocking in the theatre. The director will block the scene, choosing where the actors go, and putting things in their proper place – and that’s a good comparison for knitting. Blocking is finishing the piece, and that usually means a) getting it clean and b) putting all the elements in their proper place, whatever that place is. 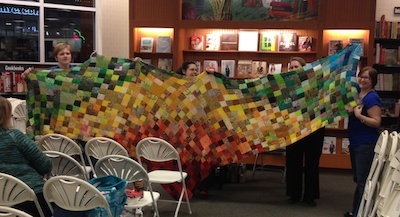 I don’t know who started the idea that blocking and stretching are the same, but I think it screws a lot of knitters up, because they think that if something doesn’t need stretching, then it doesn’t need blocking – which is totally inaccurate. 3. Blocking involves cleaning. Yarn is dirty when you are done with it. Sometimes it has spinning oils or sizing in it, sometimes it sat on a shelf for a while, and it certainly picked up oils and dirt from your hands while you were working on it. Yarn is effected by the spinning process, often compacted – and it doesn’t reveal its true character until it’s been washed. Remember, blocking is finishing the work, and if it ain’t clean, it isn’t finished. For a lot of stuff, washing and laying things out nicely is all the blocking they need. Even if I am going to steam block something, I wash it and let it dry first – then go in with the steam. Think of blocking as an activity that is all the stuff that you do to a project after it’s done – not just something you do with pins and wires. So, here we have a wee sweater. I took it off the needles, wove in the ends, tidied things up and placed it on the table, letting it be what it wants to be. Clearly, it wants to be untidy. The fabric isn’t particularly smooth or even, the yarn has a lot of body and opinion, and the edges don’t want to lie down. It’s also a lot smaller than my (washed and blocked) gauge swatch told me it would be. Nothing is wrong with this sweater though. It’s just not finished. Step one: Bathtime. 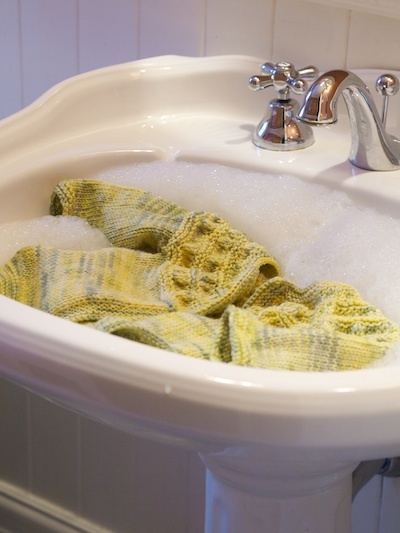 I filled the (clean) sink (I’d use the bathtub if my sweater was bigger) with tepid water and a little wool wash. (I like Soak and Eucalan equally – depending on what I’m washing.) I tossed the sweater on top and walked away. 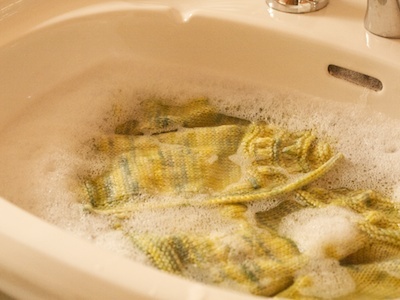 It’s important for knitted stuff to be fully wet to both get clean and be persuaded, and wool in particular takes a while to get really wet through. I wait for things to sink of their own accord, and that usually tells me that they’re good and wet. I let it soak for about 20 minutes, and sometimes a little longer. Step 2: I retrieve the wee sweater from the sink, and hold it all together, all its parts supported, and squeeze out the water gently. Then I put it on a towel on the floor, roll it up inside, and press on the towel to dry it a bit. If it’s a sturdy thing I sometimes step on the towel. I think the fabric looks better already. Step 3: I lay a clean towel down somewhere flat and big enough, and start blocking. 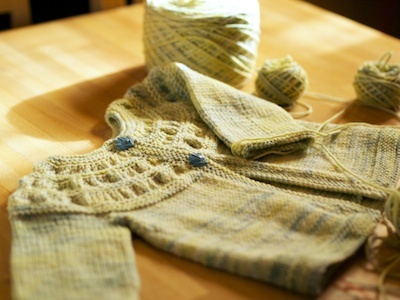 This sweater has no elements that I want to stretch (like lace) and nothing that needs opening up. 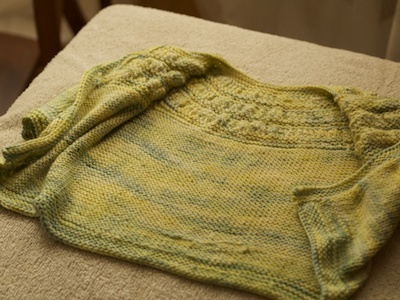 As a matter of fact, this sweater has that delicate ruching on the yoke, and if I stretch it, it won’t be as textured and pretty. That means that for this, I won’t need any pins. 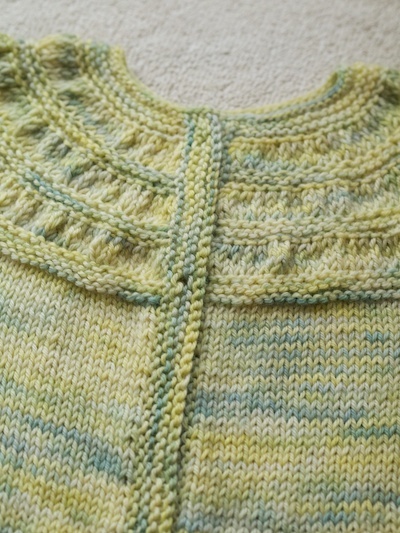 The most important part of blocking has already happened for this sweater. 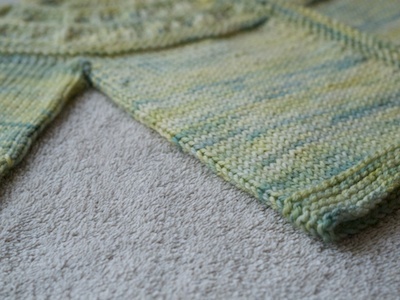 The bath has smoothed and evened the stitches, helped the yarn settle in to its new shapes, and finished the wool. Step 4: I spread out the back. 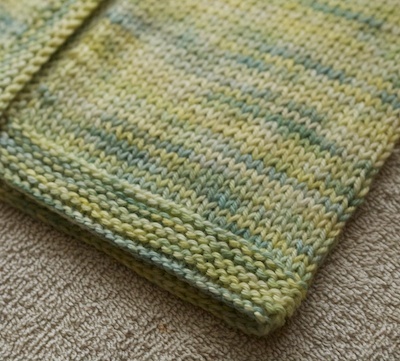 I make it straight along the bottom hem, patting everything gently where I want it to be. Step 5: I close the front, lining up the necklines front to back, and making sure that I’ve closed it so that folds at the sides fall between the decreases that tell me where the sides are. I fart with the sleeves to make sure they’re the same, folded truly along the midline of the sleeve. Step 6: I make sure it’s all lined up. Front edges to front edges, patting them into nice straight lines, sleeves extending at their natural angle, I pull a little horizontally, at the bottom edge and the cuffs of the sleeve, for this sweater I don’t want those parts to pull in, but flare a little, so I show the edges how I’d like them to be, fully releasing the cast off edges. 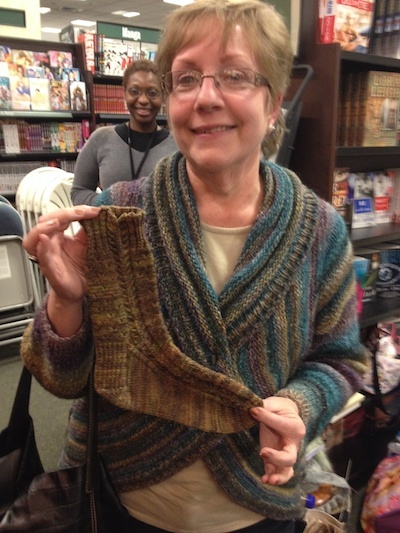 The knitting was twisting a little, the sides weren’t even. See the little spiral? Fixed it by just patting the sweater front over a little. Now it’s a nice straight line. Step 9: Keep the cat from lying on it until it’s dry. Convinced? I hope so. That’s a pretty big change for ten minutes of effort. Other kinds of garments will take more effort, or time, but really there’s not much that isn’t improved by this simple sort of blocking, if that’s all you have in you. Alison: But Steph, what happens as soon as you wash something? It needs blocking again. Right? Yup, but usually the first time is the hardest, and after that it’s just lying it flat in a tidy way. Lace would need a bit more, but well. That’s just the way lace is. 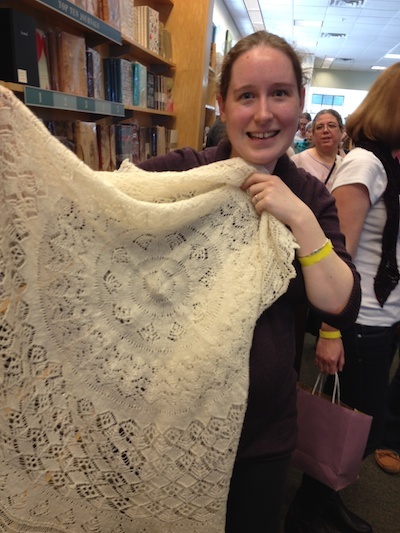 Josiphine: While you’re at it do you want to give me tips for blocking lace in the round? Robyn: i assume we’re speaking of wool here, not acrylic. which is what i use 95% of the time, with the hats i make and then give away. However, i do wash and dry every hat i make before i send it off to charity, so does that count? Yes! That does count. 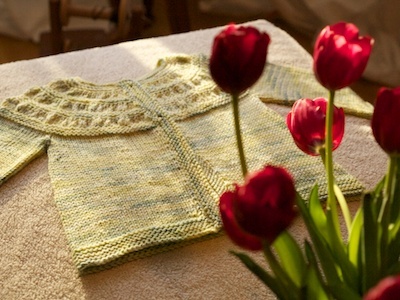 For acrylic, washing and drying is usually all the blocking it needs. It gets it clean, and helps the stitches smooth out. Acrylic totally looks better after blocking. 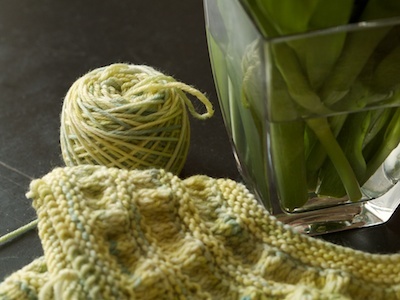 Note: Acrylic (and nylon and polyester) yarn shouldn’t be routinely steam blocked – it’s heat sensitive, and can create permanent changes in the yarn. There’s something called “killing” acrylic that you can do with steam/heat that makes it lie down forever, but it’s a one way trip, and you should experiment with a swatch first. 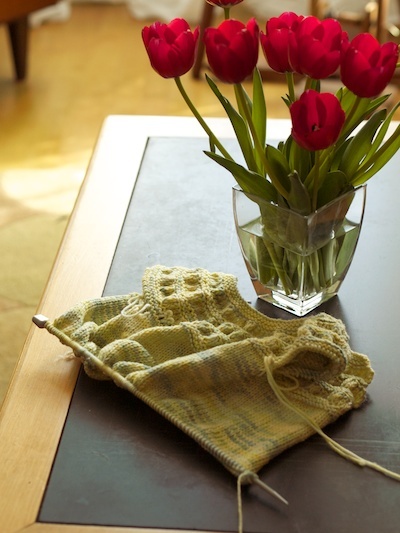 Jo-Anne: I have a cowl I just blocked, and the edges are still curling. I am thinking of blocking it again. Several People: I don’t block because it often makes things worse, if by worse you understand that I turned a sweater into a dress with blocking or my hat turned into a hood. I’m going to state an uncomfortable truth here. 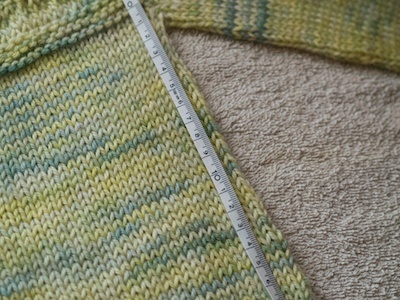 If you have a sweater or garment that gets way, way bigger after you blocked it (and it’s not superwash, which can be unpredictable) then you had a sneaky gauge problem. 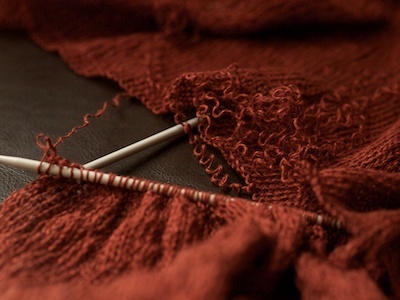 Your garment was knit too loosely. Sweaters that expand when they hit water are just revealing what’s been true about them all along – and if you didn’t block them, then gravity and movement would have just revealed that a little more slowly while you were wearing it. 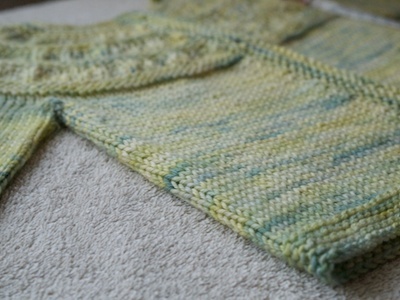 Sometimes swatches lie because knitting is three dimensional. The roundness of the stitches makes it look like you’re getting gauge when you’re really not. When the work flattens out – through washing or wearing, then you discover that your gauge was way off. This is the reason that you wash swatches. Make them reveal as many of their filthy lies as you can – before they sucker-punch you after the fact. Again: Almost always -sweaters and garments that get sloppy and loose after washing/blocking aren’t a sign of a blocking problem. They had a knitting problem you’ve just discovered super late. All right, there you have it, and I have an almost finished sweater, so I’m off to root through the button bin until I find two perfect little ones. What colour do you think? I felt it a few days ago, and I fell for it. The first tiny possible edges of spring. I was walking to the store and I saw water on the ground, seeping out from under the icebergs. The sun was shining, and bought a ticket on the crazy train. I bought tulips. I got my bike out, I vowed that from now on I would ride it everywhere I went, and then it snowed, and then yesterday morning when I got up the whole city had frozen over again into a wasteland of despair from which we will certainly never be released. Joe and I were heading out yesterday morning, and when we opened the door, we both uttered spontaneous expletives. It was -18 with the wind, and as we walked, our hearts sank. We glared at the dirty old snow, scowled at the mountains of ice pushed into the cities corners… I did my best to remember where we live, and that this is normal for us, and tried reset my expectations. Of course March is horrible. It’s usually horrible right into April. It is so unreasonable to expect Spring right now that I can’t believe I fell for its flirty little overture. Spring is a nasty little tease, and today (when I drag my bike across the ice field that is my back garden) I’m going to vow not to get too excited. If this is Spring, it is the beginning of it. It is the part where you go outside without a hat because you so desperately want it to be true, and then worry about frostbite on your scalp. It is spring in name only. It is a lie. Even though I got a grip on myself pretty quickly, one little part of it stuck. 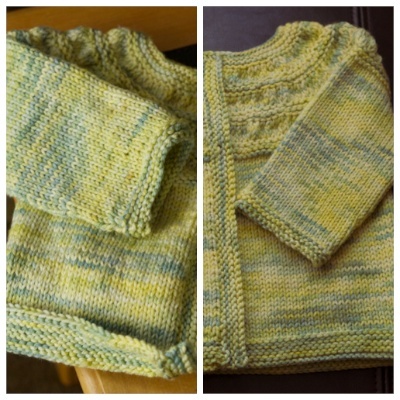 The urge to knit something quick and springy and fresh, but still warm and cozy, and I realized that if I want to knit a spring thing that fast, there’s only one person in the family little enough for me to pull it off, and that’s my new niece, wee Myrie. I grabbed something springy from the stash – gorgeous superwash wool, dyed with weld and indigo from Abundant Yarn and Dyeworks, and settled on a quick Tiny Tea Leaves. 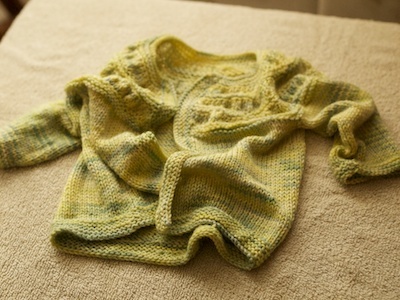 I thought I could knit it in one day, but it turns out this little sweater isn’t that quick. 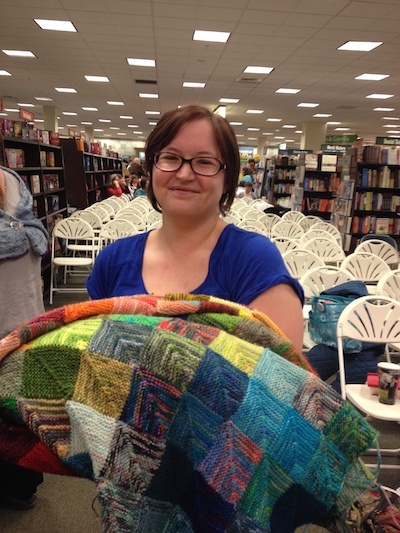 First, maybe you can knit that sweater in a day, if you actually sat down for the whole day to knit, which I didn’t. I don’t know who I think is going to do all my other stuff while I’m sitting there, but I couldn’t make it happen. Also, I chose the size two, because that Myrie, she’s growing faster than crocuses sprout (when they finally turn up, that is) and sizes for babies tend to run small. So many parents with six month old babies dress them in a size one, or larger – and I didn’t want to have it be too tiny, too fast. Let it here be noted that this pattern isn’t lying at all. 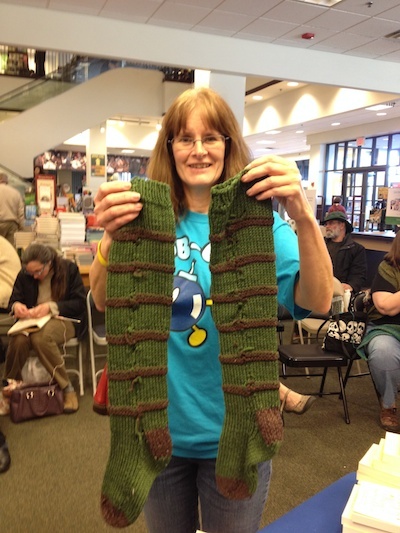 It is an honest to goodness size two – so it’s a little more knitting than I planned. 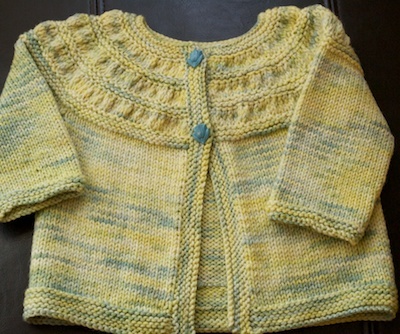 (And might mean that if I want Myrie to have a spring sweater, rather than an autumn one, I might have to knit another littler one after this. We shall see how it fits the little Miss- and besides, she’ll be bigger by the time I finish this tomorrow.) 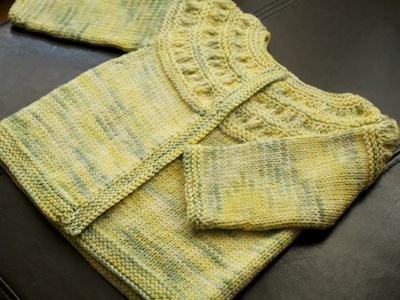 Third, and I can’t stress this enough, the way this pattern works is yarn and knitting intensive – the ever-so-charming gathers on the yoke are created by doubling the stitches, then decreasing again after several rows, and you wouldn’t be expecting there to be many rows with almost 300 stitches on them in a tiny little sweater, but there it is. Despite these three things absolutely being obvious from the get go, I was a little surprised when after knitting for ten minutes, I didn’t have a sweater. I think it’s doable today, but then again, I also thought it was spring, that Adriana would finish herself while I knit this, and that the smell in the fridge would go away if I didn’t think about it. Clearly, the winter has made me delusional. 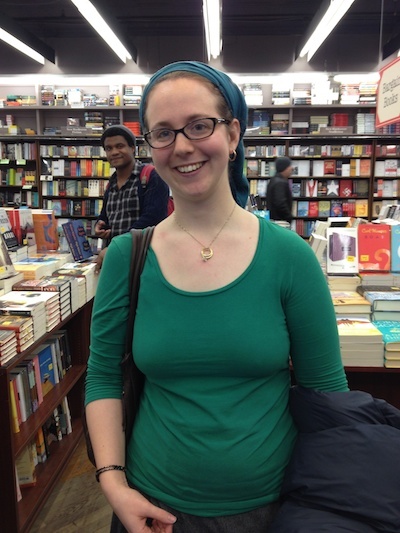 PPS: If you’re in Toronto, don’t forget that Rachel Herron is making a book tour stop here this evening. She’s lovely. 1. I am still knitting Adriana, despite my feelings. A bunch of you in the comments are right though, Adrian must die. I’m going to wind the whole thing into a ball and toast his demise. 2. Even though I am still knitting Adriana, you cannot tell. I am in a black hole. 3. I am thinking about stepping out on her with my spinning wheel for a little. That’s not the same as cheating. 4. Who cares if I cheat anyway? It’s knitting. I’ve made no vows, nor promises. I’ll be as adulterous as I want to be. 5. Sort of. I would really like to wear Adriana in Texas, although in thinking about it, I can tell you I’ve done that weird thing again, where I knit an accessory, but have no idea what it goes with. What outfit do I think I’m going to wear it with? 7. Lou has hidden my ball-winder. 8. 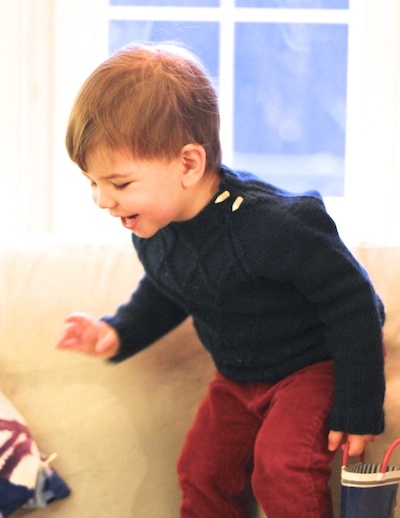 Wait, did I show you the pictures of Lou in his new sweater? Photo’s courtesy of Kate and Carlos (that’s mum and dad to Lou) and I know they’re a little blurry in spots, but you gotta trust me. 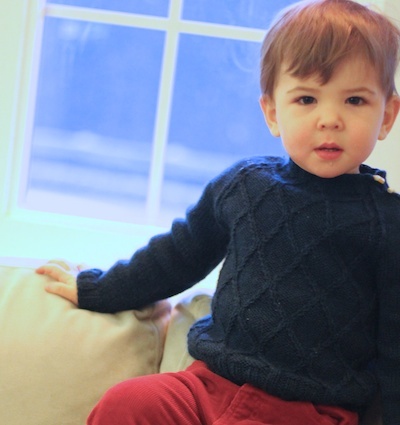 It’s still dark in Toronto, and Lou’s a fast moving kid who shows little interest in a formal knitwear modelling career. It makes it hard to get good snaps. This sweater fits like a dream. 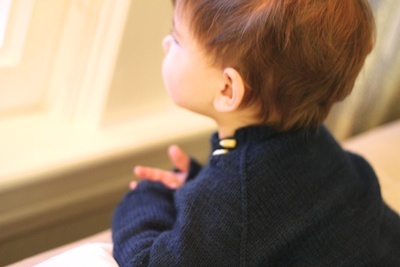 Actually, all parts of the sweater are dreamy. 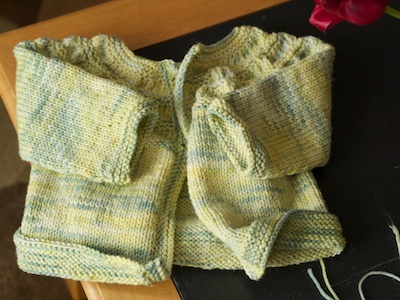 The pattern is Lancelot, which was pretty easy and fun to knit although there is a bit of a whoopty-do around the short rows for the neck. It’s totally fine if you just follow the directions like you aren’t thinking. 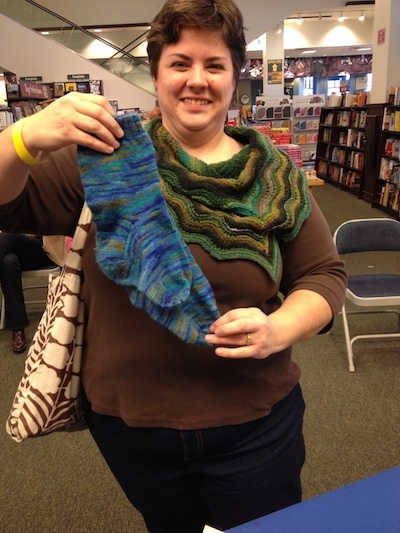 The yarn was perfect too. Soft, warm, a gorgeous colour. Klickitat Hand-Dyed wool from the Artful Ewe. I think he’s going to wear this one for a while. I am so sick to death of knitting you that I could die. I look at your endless linen stockinette and I think terrible things. I think of a small fire. I think of burying you in a shallow grave. I think of you “accidentally” being snipped over and over again into a million tiny little pieces with a guillotine paper cutter. 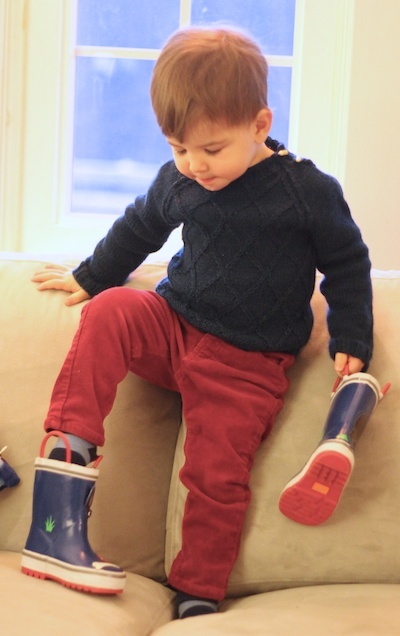 (I would need to buy this piece of equipment for this terrible mishap to be possible, but I am starting to feel that this would be a prudent purchase.) I wish I had a dog so I could set you carelessly on the chesterfield, perhaps smeared in bacon fat. It isn’t that you aren’t a great knit. I think you are, and although there’s snow forecast over the next little while, I do know that summer is coming, and you’re going to look great and totally be worth it. The thing is that even though I haven’t technically knit you before (just your tricky masquerading brother – Adrian) that is not how it feels. It feels like you and I are in a relationship with no goals. No future. Just me, you and unending stockinette in linen, and the fact that I’m unravelling your previous incarnation as I go makes it feel even more like you’re a Sisyphean task. 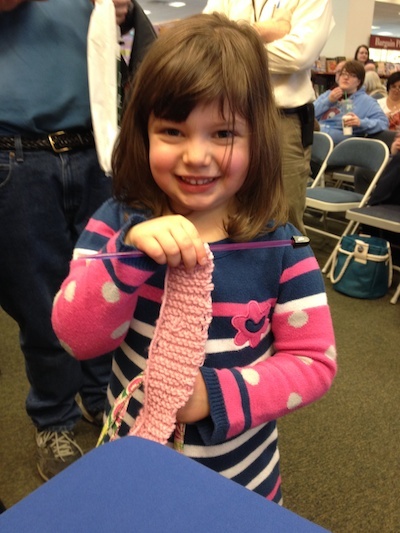 I unravel a row, then knit it into a row, then ravel a row, then knit a row. I’m starting to live for the decreases that happen every so often, because they break up the monotony, and that’s just sad. An SSK is nothing to pin your dreams on. 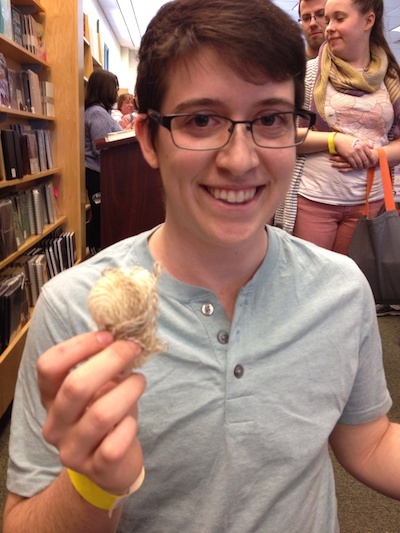 I want you to know – I’ve started looking at other yarns. Soft yarns. 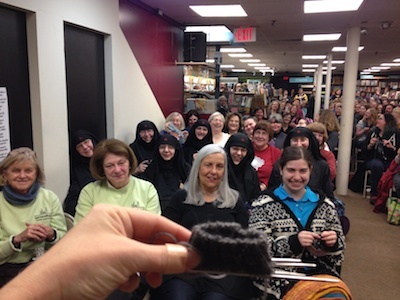 Woolly yarns. Yarns with potential and charm and a colour that isn’t the same as yours. I am starting to feel just fine about the swearwords that have become a natural part of our relationship. I feel like you deserve them. I don’t know how much longer I can hold on. Oh petals, I am, as my friend Debbi would say, a husk. I’ve got nothing. I got home yesterday and pretty much fell over, and today I’m setting the house to rights. I slept in my own bed, this morning I drank my own coffee, today I’m vacuuming my own cat’s hair off my own carpet (that’s less thrilling, but still part of being home.) I’m cooking a Saint Patrick’s day dinner, and dusting and contemplating having a beer mid-afternoon – which is so decadent I can barely speak of it. I swear I’ll get back on the blogging train tomorrow, but for today there’s email to catch up on, kids to talk to, family to touch base with, and I really, really need to find out what that smell in the back room is. 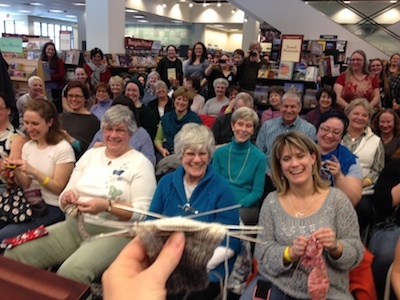 Tomorrow, let’s talk about knitting, shall we? I’m so very, very glad to be home. This morning I’m travelling home, and I had these big elegant plans to finish up the last of the tour posts, and make everything nice and tidy before boarding the plane, and then I’d arrive home and everything would be beautifully finished. Sadly, I’m still me and the planet still thinks that’s hysterical, so it would appear that I’m going out with a whimper, rather than a bang. Two things have gone wrong, more or less. First, this morning as I packed up my hotel room and got ready to go, I noticed my notebook on the desk, and I thought “don’t forget that Steph” and then I walked away and left it there. Like it was garbage, like it was dead to me – and I actually wouldn’t care that much about it, except I put the little notes on who’s who from the pictures I took in Exton into that – so you’ll all have to forgive the part where I can’t remember hardly any names. (Usually I write them down so that I can remember they next day. If you’re in these pictures, just tell me, I’ll edit the post later and put your name in. I’m so sorry.) The second thing that seems to have gone wrong is that for reasons that can only be related to the way the universe hates for me to wrap things up nicely – the usually reliable Philadelphia airport won’t let me have any internet. So while this post is being written in Philly, it will be posted from Toronto. I’m trying not to care. 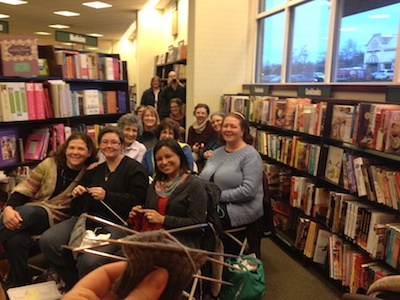 Wanna see the bunch from Exton? You’ll notice that they’re tucked into nooks and crannies this time. 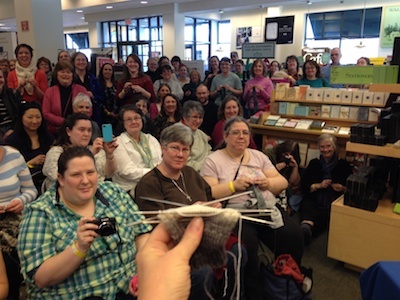 The bookstore was a little surprised at the size of the event. 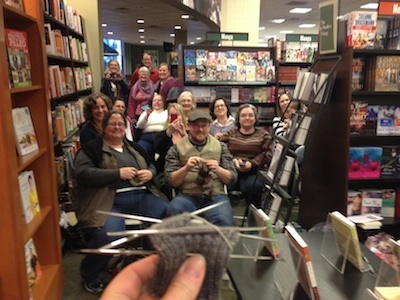 It seemed to me like they did their very best, considering a knitter train hit them. 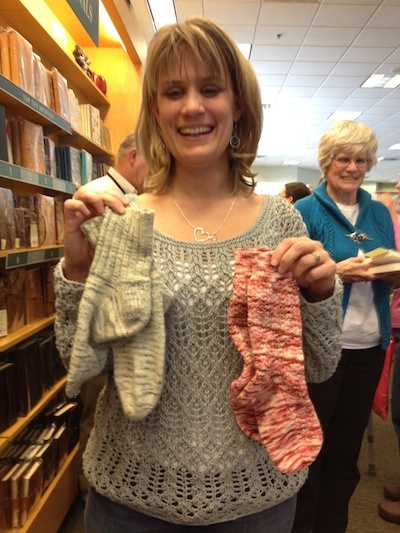 Wanna see first socks? There were some beauties. I wish I could remember this lady’s name, because man – she was thinking. She brought her first and current pair, just to make sure I was up to date. 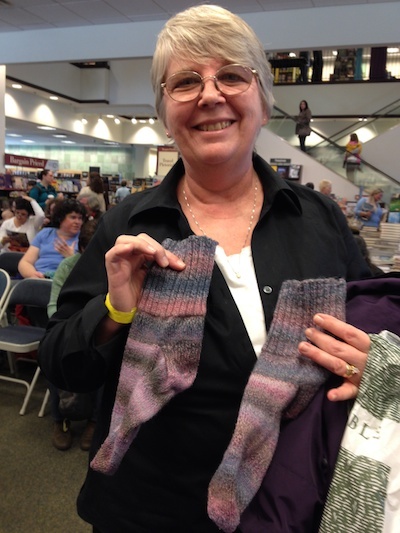 This lady – her first pair had some very charming problems. 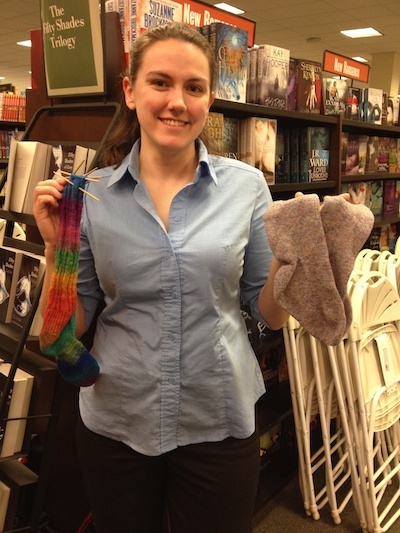 She was a brand new knitter when she made them, and she didn’t know what to do with the ends. She didn’t let that stop her though. Not even for a minute. She just tied them all in knots. How about this pair? This pair? This nice mummy made these for her husband, and he’s a re-enactor, so to make them authentic, she didn’t use superwash – which totally explains how he felted them by accident. Hold on now, because I saved the best for last. She’s four. 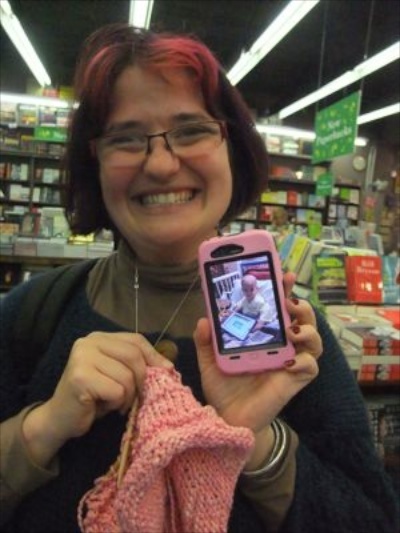 She’s a perfectly good knitter, and she’s the cutest thing I’ve seen in a while, and the perfect note to end on. I’ll see you tomorrow. From home. I arrived in Baltimore yesterday around 4pm, and I was up and gone to the airport by 8am this morning, and so what I am going to show you here is really all I saw of the place. 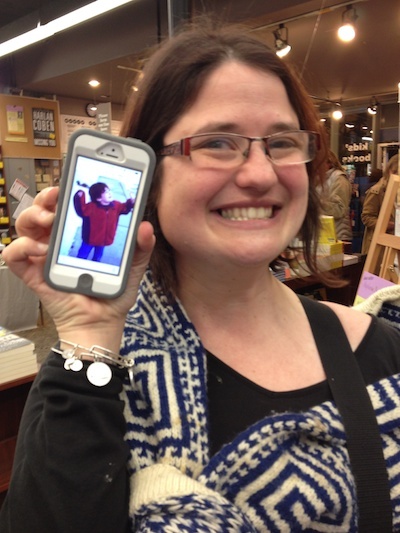 I saw the airport, the bookstore and a hotel. (I can tell you one thing I learned – the place where I was? Not so walkable. I looked at the map when I was in the hotel, and figured out quickly that the easiest way to get to the bookstore was to walk. It was close, it would be easy, and it would be nice to be outside. Ten minutes later I’d trucked past a shocked doorman, who tried desperately to call me a cab, and I was walking along the side of an overpass and crossing ramps without lights, and five minutes later, someone actually stopped their car to ask me if I was okay. A few minutes after that, I realized there was no sidewalk into the mall, and got honked at twice while I was trying to cross the street legally. People were looking at me like I was a kangaroo. When the event was over last night, the store manager said that there was no way I should walk back to the hotel, and confirmed that he doesn’t expect any pedestrians, doesn’t look for them, and that it wasn’t smart to be one. Driving is the way it works. Coming from a city like I do, it was a really surprising thing to hear. A city where everyone has a car? Heck, half of the people I know don’t even have a driver’s license – never mind a car. I chose life and accepted the lift back to the hotel.) While you might not be able to walk there, it’s pretty clear that the joint is chock full of really nice people. Behold! Our people of Baltimore! 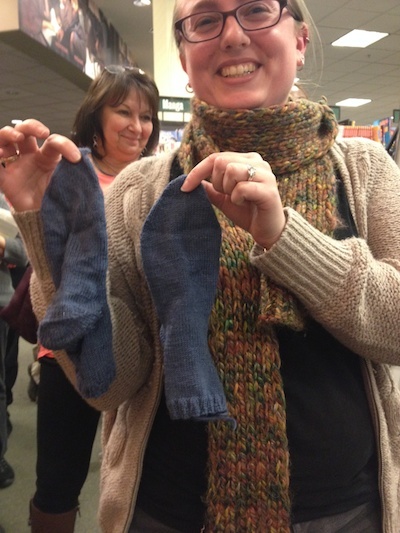 The pair I’ve been plugging along on turned up finished while I was in Boston – and that was days ahead of the sock deadline for this month. 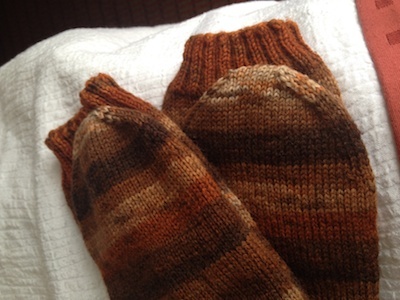 The finished ones are Trekking XXL colour 538, and my basic sock pattern from Knitting Rules. 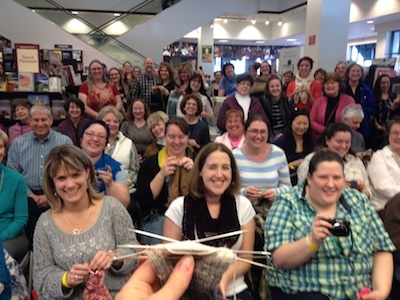 Baltimore was a treat, and the knitters couldn’t have been nicer. 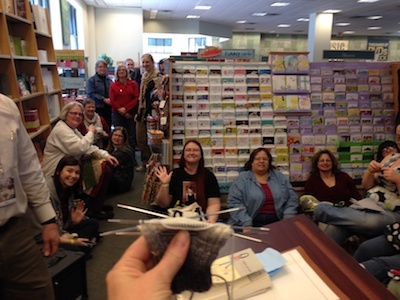 There was the now ritual parade of first socks, and as always, most of them came with a twist. 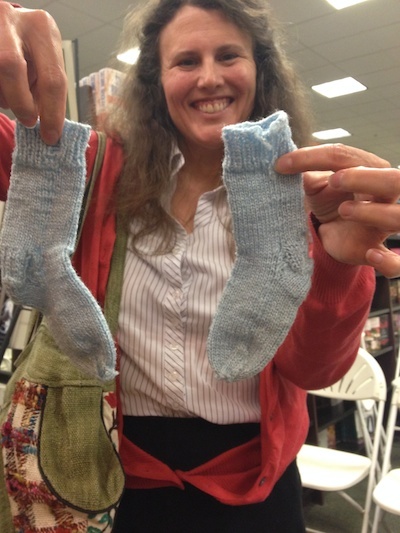 Here’s Kathy, with an appropriately tiny and bedraggled first pair. 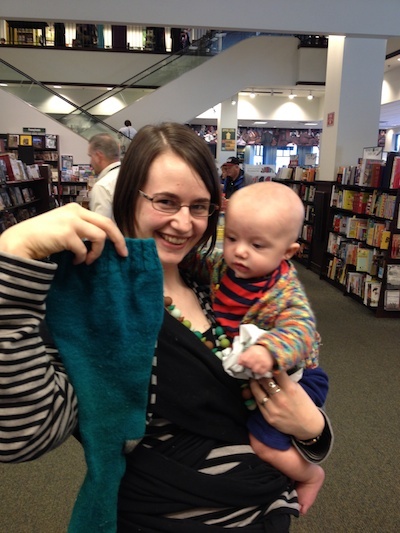 Sarah arrived with her first sock (she didn’t quite make it through the first one, and that was quite some time ago – like, years) but she brought her mum’s first pair to prove that she’s genetically predisposed for success. And last but not least, Cindy’s son got deployed, and she got custody of his husky, who promptly ate the better part of her first pair. But my friends, Melissa got a crazy case of it. I don’t even want to think what her viral load is like, because ladies and gentlemen, she’s not even halfway done. What a sight. 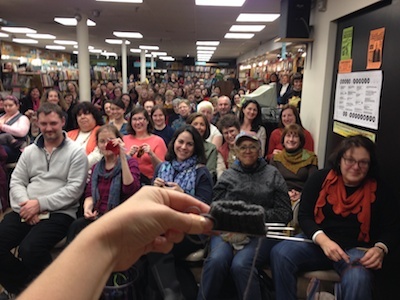 That’s five knitters holding it up, and Melissa’s just getting into the blues. It’s was a miraculous thing. Several of us almost fainted dead away. And that was Baltimore. More tomorrow about Exton, I’ll write about it tomorrow when I’m at the airport, because it was lovely (although we were sort of short on chairs) and I’ll have time in the morning… on my way home. What a beautiful word. Let me tell you something about Boston – Not once, ever when I have been there, has anything even remotely normal happened to me – and that was certainly true this go around. As a matter of fact, I’d have to say that Boston kicked it up a notch this time – putting the icing on the cake when the fire alarm went off in my hotel way, way too early in the morning and we had to evacuate, and then popped a little cherry on top when my flight got delayed and turned the trip into a big of a rush, now that I’m here in Baltimore. I love Boston a lot, but it is not screwing around when it decides to be interesting, I’ll tell you that for free. Wanna see? Sure you do. 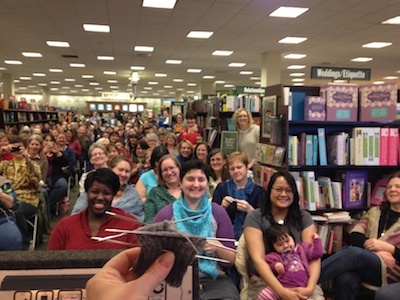 Here’s the seemingly normal Boston crowd. 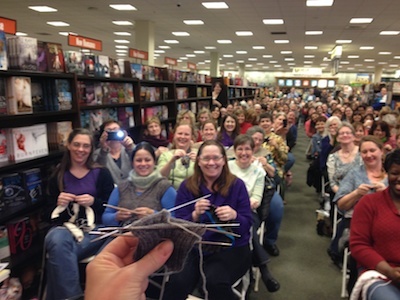 It all seems pretty normal, if you call what I’m doing on this book tour anything remotely normal, but it’s not normal. See this? This is Michelle. 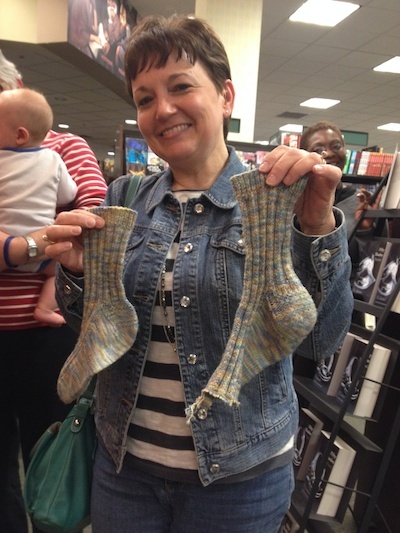 These are her first socks. Seems normal, doesn’t it? SURE IT DOES. 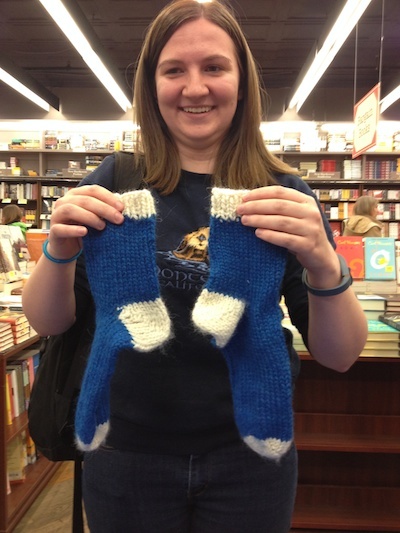 Until you find out that they might be her first socks, but they’re also her second project. Ever. That’s not normal. Also not normal was the wonder that was Susan. 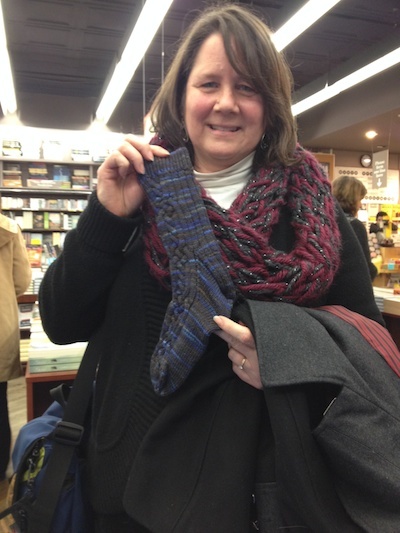 Susan walked up and said it was her first sock, and I looked at it, and the thing is perfect. Totally perfect. It’s got complex cables, it’s the right size, there’s not a mistake on it, it looks like a 1000th sock. I was totally flipped out until I realized there’s only one. That’s a little more normal. This is Deborah. She was pretty normal, and it was her birthday. She was pretty normal until she handed me a challah that she’d baked, and I remembered that last time she and her husband brought me butter tarts, and I started to wonder if they’re normal after all. I’m not objecting, in any case. 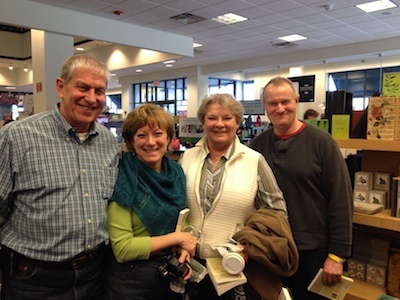 I signed between Sue Monk Kidd and Wally Lamb. It wasn’t normal.